Fall in New Mexico brings the International Balloon Fiesta, roasted green chiles, and a bountiful harvest at the Downtown Growers' Market. We had a very busy weekend full of all kinds of fall festivities. Saturday morning marked the start of the Albuquerque International Balloon Fiesta here in our new hometown. Our little puppy Zoey (more to come on her) gets up at 5:30am every morning so sleeping in doesn't really happen anymore. Luckily, the balloons take off super early in the morning so we were able to put the little nugget's early rising to good use. We opted to forgo the craziness of the actual Balloon Fiesta Park and headed north on I-25 to find a good vantage point for viewing the balloons. Just off the Paseo Del Norte exit we noticed several groups of people hanging out in the Target parking lot so we decided to join them. There was a retaining wall to sit on next to a grassy area, which worked out for us. Next year we'll be a little more prepared with camp chairs, blankets, and breakfast etc. Zoey experienced grass for the first time (our backyard is all rock) while mommy and daddy watched the early morning mass ascension. She seemed to enjoy it and munched on grass chunks intermittently between milk bones. Our proximity to the launch site made it difficult to take good photos with my iPhone but in-person it was truly a site to behold. 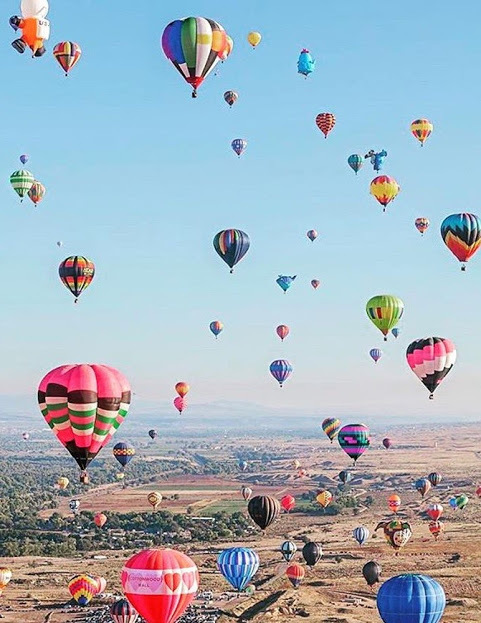 There's just something magical about hot air balloons. A nice family that was watching next to us even offered us some delicious cinnamon roll feast, an invitation we happily accepted. After watching the mass ascension we headed to the Downtown Growers' Market, one of our favorite Saturday morning activities. The main goal of this particular outing was to socialize Zoey and start getting her used to walking on a leash with her harness. People came up to us as we made the rounds and gave Zoey all kinds of hugs, pets, and kisses. She in turn reciprocated with puppy nibbles and the occasional kiss. Green chile roasting, which started in early September, was still going strong at the market. The smell is absolutely amazing and the taste is even better. Here in New Mexico you can get green chile with almost anything and I've become a huge fan. It's so dang good. I've learned that the smell of green chiles roasting is synonymous with fall in New Mexico. While I miss the fall leaves of my former residences, I'm embracing the new experiences fall brings living in New Mexico.